Fall baking is now in full swing in my kitchen – how about with you guys? One of my favorite ingredients to use when baking in the autumn months is apple butter. It’s rich, it adds a ton of flavor and moisture to whatever it is your cooking. One of my best friends and her husband gifted me with a homemade jar last Christmas, they do it the old fashioned way up North – with a big pot and a party that lasts all day! As good as it was, you know it didn’t last anytime in our house. Luckily, Musselman’s makes a really tasty version that’s available in your local grocery store year round. They were good enough to send me a fall baking gift set – with some disposable decorative liners to gift baked goods in, some great recipe cards, as well as a big jar of their apple butter. I was immediately drawn to this spiced apple cake (predictable much?) that’s topped with a sweet orange glaze. The cake is delicious and moist, without being too dense…and has all my favorite warm flavors of fall. Topped with the simple glaze that carries a punch of freshness from the addition of fresh orange juice and zest. You can either bake as one large loaf, or do as I did and bake 4 smaller loaves to give as gifts. We have a freebie gift set to giveaway to one lucky reader too! Just leave a comment telling me what’s your favorite recipe to make with apple butter? My friend Annie posted a panini earlier this week that is next on my hit list! So many good things to do with the stuff. Contest will run today through next Thursday (10/10/13) at 11:59 PM. I hope everyone has a great weekend! Add flour, baking soda, salt, cinnamon, nutmeg, ginger, and cloves to a medium bowl. Whisk to combine. Cream sugar and softened butter in large bowl. Add eggs, beating thoroughly. Beat in dry ingredients alternately with buttermilk. Stir in apple butter. Pour into a greased 9x5x3-inch loaf pan (or 4 smaller loaf pans). Bake in 350°F oven 55 to 65 minutes or until cake tests done (I cooked the mini-loaves for 40 minutes). Cool 10 minutes before removing from pan. I just like to eat apple butter on toast! That’s my favorite thing to use it for! My daughter loves apple butter sandwiches with banana slices. We usually do a quessadila in the fall for that warm tummy feeling. We love it on toast! SO good. Apple butter and natural peanut butter sandwiches on whole wheat bread. I’d love to use apple butter to make pumpkin apple butter gluten free cookies this fall. I’ve never tried it, but I think it’d be delicious! Apple butter speaks Autumn to me. Love it on hot buttered biscuits and it’s also delicious on pancakes with or without butter and maple syrup. For fall get togethers I use apple butter (musselmans) along with cream cheese. treat for children as well as adults. You can also use lite cream cheese. 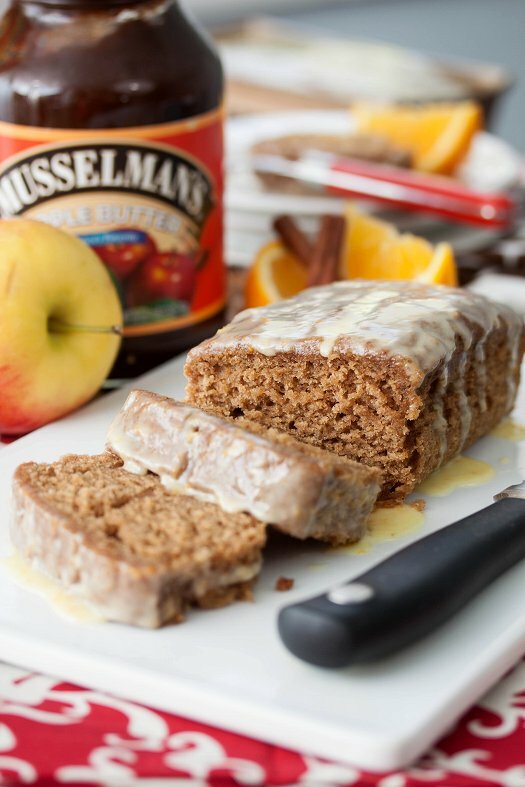 So far, I’ve only eaten it on toast but I think this Spiced Apple Cake with Orange Glaze will be my new favorite recipe to make with apple butter. It sounds delicious! I like muffins made with apple butter. i have a smokey sweet bbq sauce i love to make with apple butter!! perfect for pork chops, meatballs, anything really! Glad to find your recipe. I have all the ingredients here on The Shore! Thanks!